Posted by Erin Ptah in Personal. Mom was in town last week, so we hung out on Friday…and obviously had to visit Cleveland’s new cat cafe. So we show up at the cafe, the staff give us a quick rundown of how to behave inside, they usher our whole group into the Cat Room…and there, curled up on a wall shelf across from the door, is Fluffy. He’s of the cats they specifically called out beforehand, saying “don’t approach him in large groups or you’ll scare him, just go up one at a time, and give him a chance to get used to you.” I walk up slowly and give him some gentle skritching. After cautiously tolerating it for a bit, he leans into it. I did check out the rest of the room — petted/hugged/played with various other cats — but at the end of the hour, I put a hold on Fluffy. 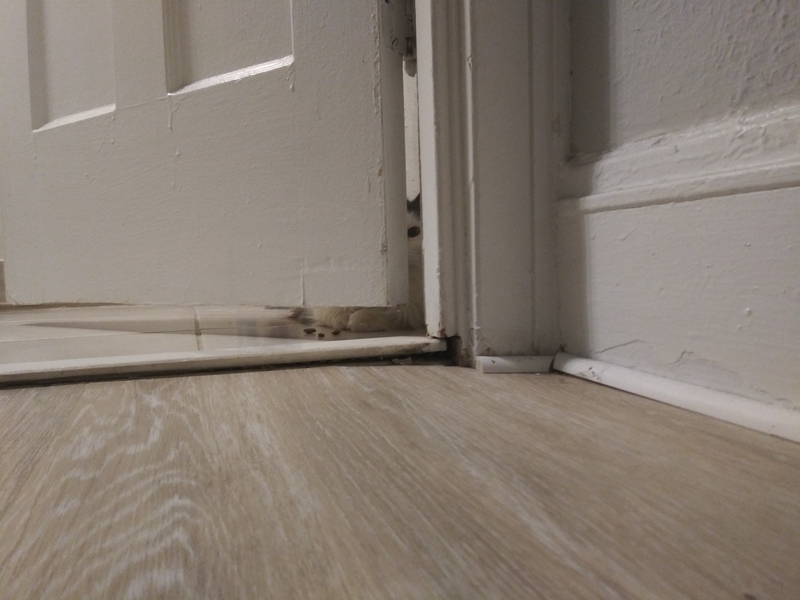 And by evening, he was hiding in my bathroom! He’s mostly white-furred, with cookies’n’cream black spots (Fluffies’n’Cream! ), and chronically-suspicious green eyes. 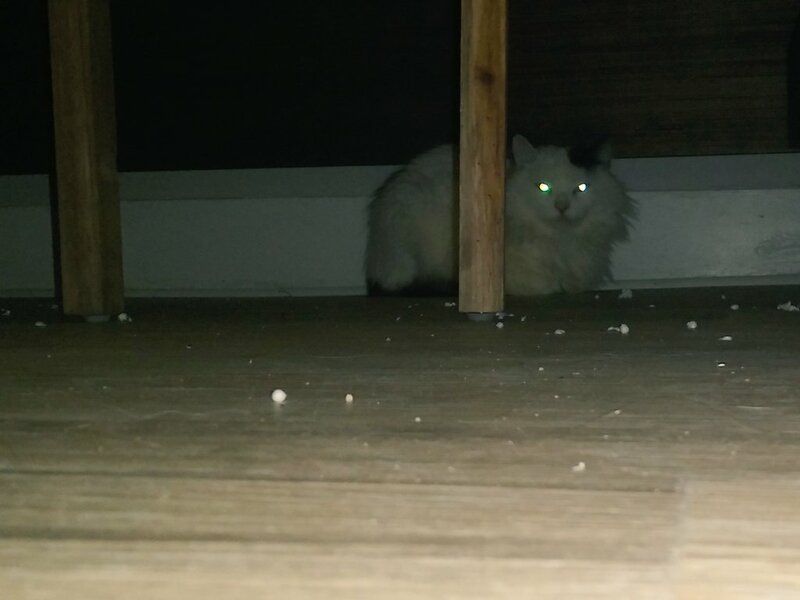 The Fluffmeister was an “on-site surrender” in a humane incident, meaning his original home got reported to the Animal Protection League as unsafe, and a team went to pick him up. 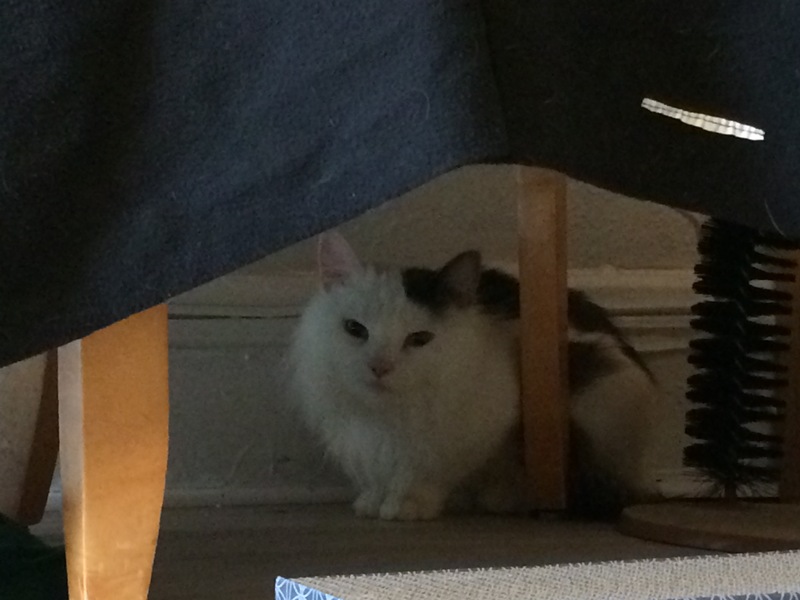 (Along with one other cat, who was more sociable, and got adopted earlier.) At the time, he was underweight and dehydrated — the APL shelter put him on a special diet at first, to get his weight back up. Even now, he only weighs 6 pounds. The fluff looks even fluffier because his actual frame is so tiny. And he’s 2 years old — gotta wonder if this was always his potential full size, or if he was underfed going back to kittenhood, and it stunted his growth. 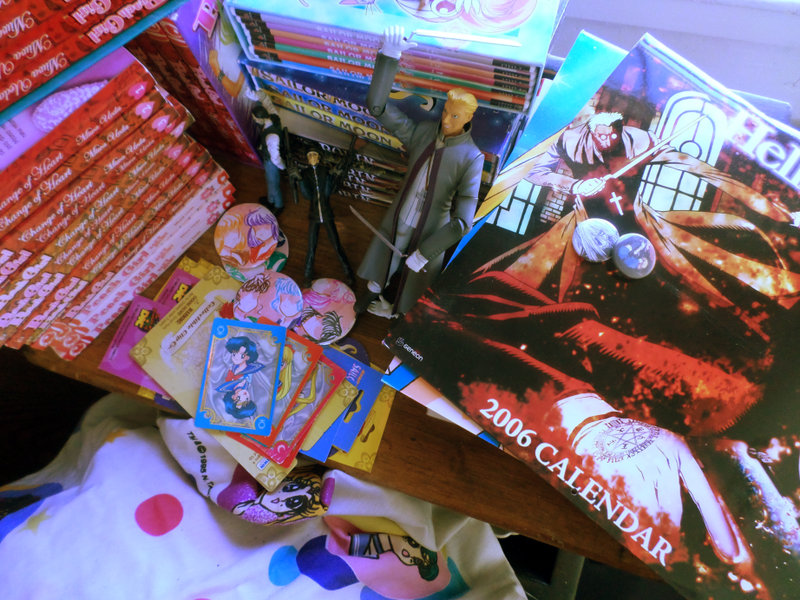 Along with some boxes of Leif & Thorn books, and other convention merch. In the bathroom I’d petted him and coaxed him to eat some treats. 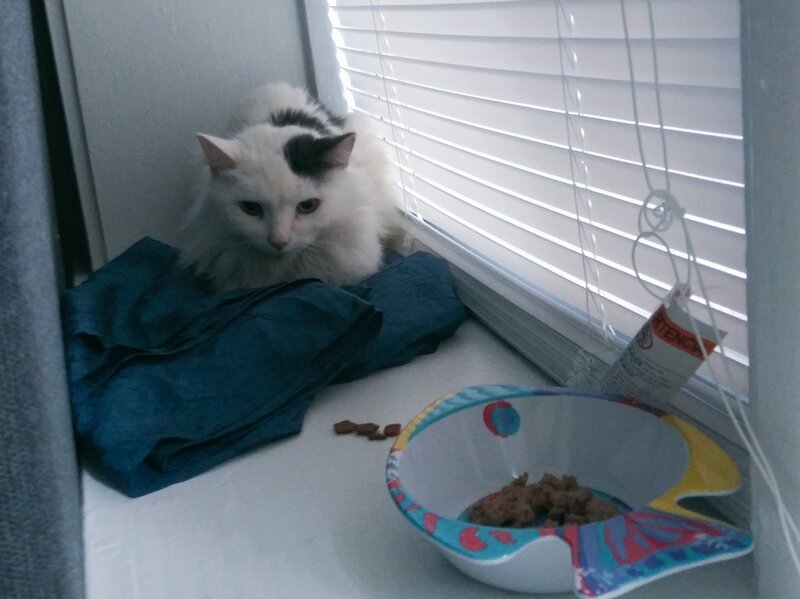 Here I put his food bowls under the end of the daybed, and he ate while he could see me in range to see him. So far, so good. Then on the evening of the 6th, I did one last check-in before going to bed…and he wasn’t there! At some point he’d made a break for my bedroom. Managed to get there without me even noticing. Also, he’d done his business there, instead of in the provided litterbox. Sigh. So that night we both slept in the bedroom — me on top of the bed, him underneath. It’s the only room (other than the bathroom) with a door that closes, and I kept him shut in there for the day. At this point he was only eating when I was out of the room, so I held off on any further petting. Still no use of the box, though, and on the afternoon of the 7th, Floofatron 3000 went and peed on the bed. I did some cleanup work, and then, since the mattress was too big to offer any chance of hauling it out of the room, I managed to upend it against the wall. Ooh, he did not like that. 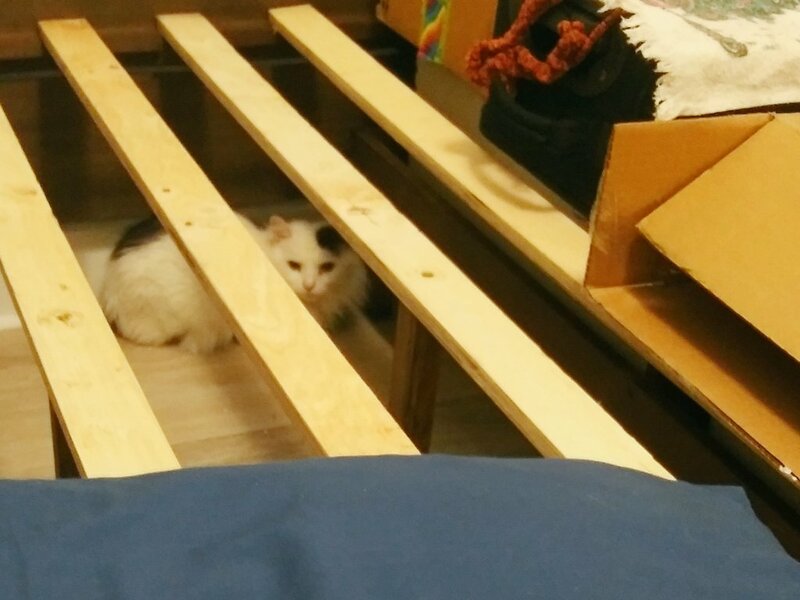 The mattress was by itself on top of the slats of the bedframe, so it was the biggest part of his shelter, and having it removed was a Terrifying Ordeal. I briefly planned to relocate him to the bathroom. At the cat cafe he’d been incredibly easy to scoop up and pour into his carrier, and he was quiet and docile throughout the car rides, even during our stop at the APL for microchipping. Should be easy to move him again, right? I did finally corner him, got a hiss and a scratch, and started formulating a new plan based on leaving him in a cat-proofed bedroom. …and it’s working pretty well so far! 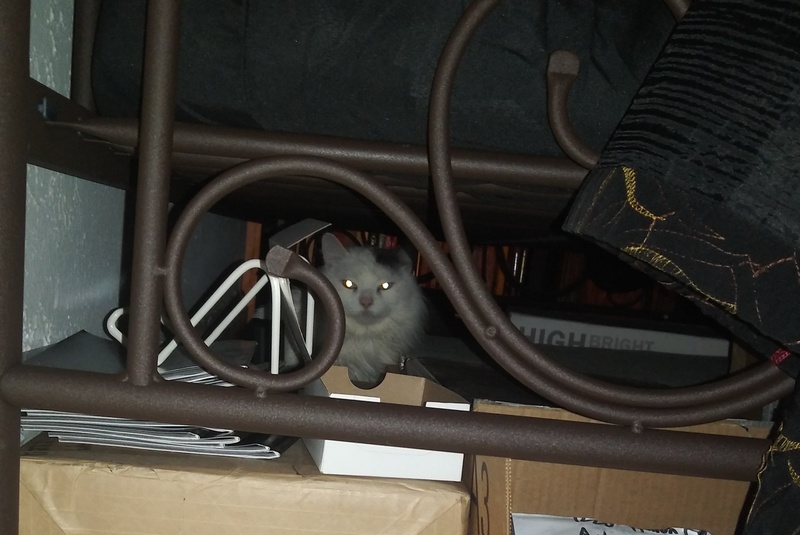 The Terror That Fluffs In The Night finally started using his litter by the night of the 8th, once I squeezed the box into a corner where he’d peed before (and removed the mattress as an alternative). 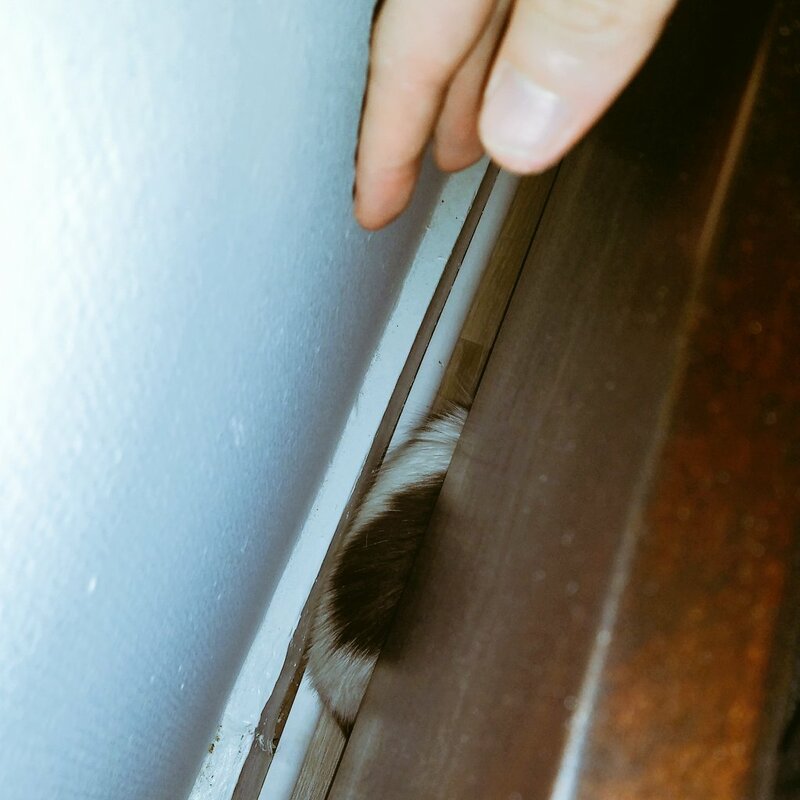 Here he is under the de-mattressed bed. The boxes/suitcase are positioned to keep him from climbing into the under-bed drawers. 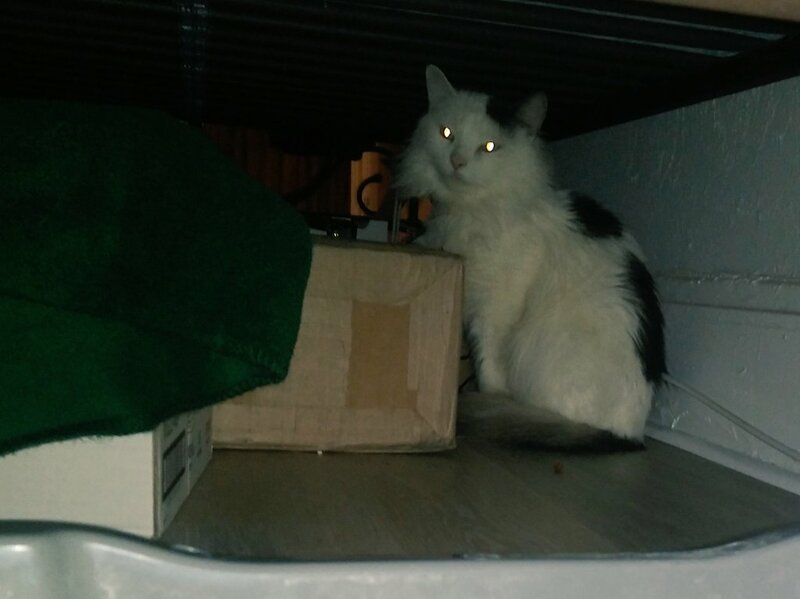 There are some thinner boxes under the under-bed drawers, to keep him out of that narrow space. Cleaning supplies are on-hand. His new favorite place is up on the windowsill. It’s about the height and size of that shelf he had at the cafe — and part of it is sheltered by the upturned mattress. Looking real suspiciously at his food in this shot, but it still disappears when I’m not in the room, so it can’t be too bad. 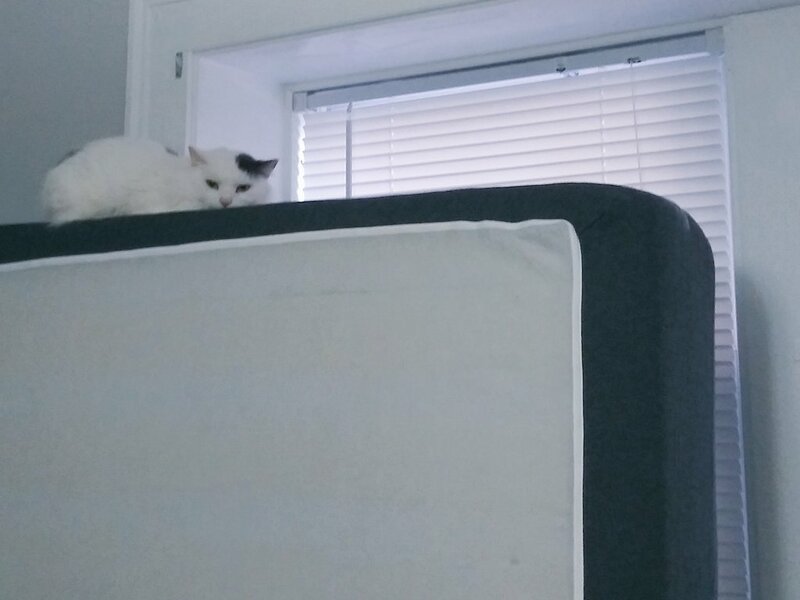 His other favorite place is the new highest point in the room…the top edge of the mattress itself! I’m not putting his food up there. Sir Edmund Fluffery will just have to venture back down when he’s hungry. We had our current routine established by the 9th. I check in a few times a day, to refresh his food, clean his box, maybe leave some treats, and say calming things while standing at a safe distance. At the shelter it took The Fluffington Post about a month, with consistent routines, to start feeling comfortable and letting people pet him. Longer than I expected based on his first-night performance, but not longer than I’d bargained for. Sounds like he hissed/swatted at them on a more regular basis until he adjusted, so he’s at least starting on a better footing here than he did there. Took him that long to start playing with toys, too. And he’d stop if he noticed you looking. He does have this weird way of eating, very slow, one piece at a time. Someone at the cafe speculated to me that she thought he’d lost some teeth. The person from the APL couldn’t confirm or deny that, but she did say they didn’t find anything to be medically concerned about. He always sat on the highest shelf in his kennel at the shelter, too! But now that we have a routine set up that covers all the basics, he’s going to get all the time he needs to get comfortable and come out of his shell. In the meantime, I’m leaning towards Marshmallow Fluff as his full name, so I can make jokes about his great shelf life. 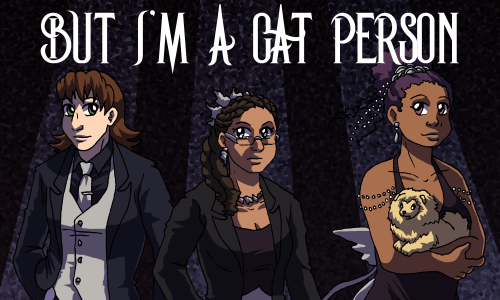 Finishing up the December talking meme, a respectably-short amount of time into January: Kaldra wanted me to write about cats. Cats are great. 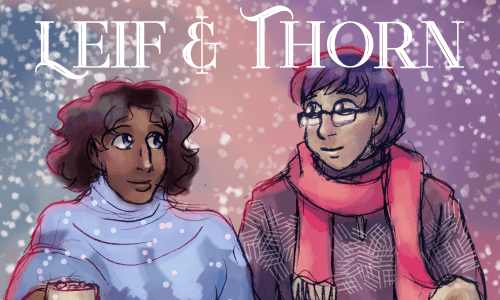 They’re beautiful, they’re nerds, they’re helpful, they’re doofuses, they’re adorable. I finally got on Instagram this year, and I’m making sure my gallery has a healthy proportion of cats, because I have a heck of a backlog of photos and it’s not like I’m doing anything else with them. He is the cuddliest critter you ever will meet. 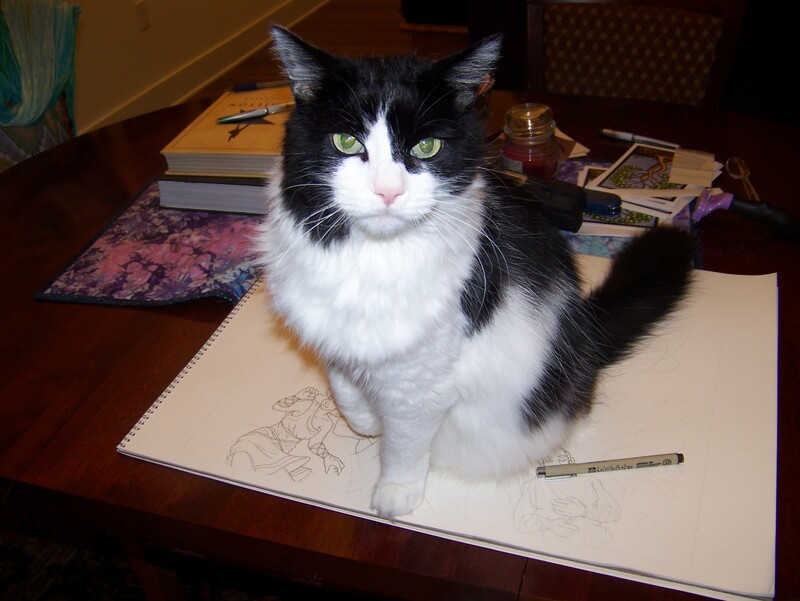 He insists on sitting on my sketchbooks, sometimes when I’m in the middle of drawing in them. Every night when I go to bed, he follows me in and spends several minutes diligently licking my face. Where a pet shop in Chinatown explores the true meaning of Christmas, and what was obvious all along is finally realized. At least, in part. I haven’t even gotten a chance to comment yet, it’s so long — but if you’re in the fandom, go give it some kudos. There are some family visits coming up in January, and more things designated Christmas Presents will be handed around then. Like I said in an earlier post, we’re not real sentiment about specific dates. So far: all the RL gifts are practical and useful, but not much to blog about. Literally towels, hangers, a chest of drawers, an afghan, a vacuum cleaner. A couple of large checks, some of which is getting invested in fandom merch (there are a few webcomic collections I’ve had my eye on), most of which will go toward rent, groceries, and my IRA. I also pay for a lot of digital music now. Although I do it with the gift cards Bing gives you for using their search engine, so that may not be quite the same category. My whole family doesn’t get real sentimental about exact dates of holidays. One year we went to San Diego over the winter vacation, and got Christmas-day plane tickets because they were the cheapest. If people can’t meet up in December but we have a gathering in mid-January, then we’ll just save the presents and do Christmas in January. So that’s nice. Picked up the tree for free off of someone’s curb one January. It was the perfect size for a tiny apartment. Plus it came apart into pieces you could stuff in any box, and went back together super easily. Now it’s been six months since I put it out on my own curb before leaving MA. Sure hope it got picked up by a new person who will appreciate it just as much. 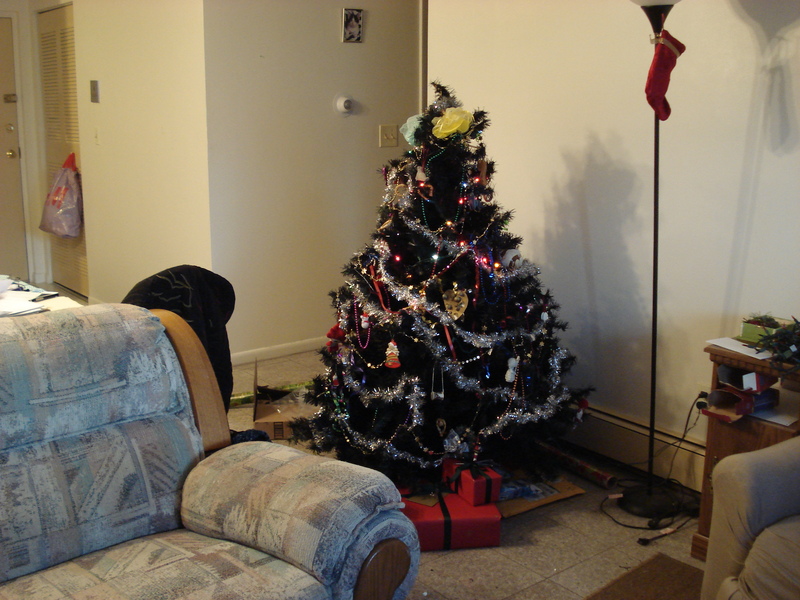 Still have the tinsel and ornaments, though! My aunt doesn’t have a tree, so the ornaments are still boxed — but from where I’m sitting now, basically every direction has some tinsel draped over the most convenient surface. Prompted by jjhunter. I last did this meme in April 2018 — pre-move, between jobs — so let’s see what’s changed. …where my parents lived for the next three years. I don’t remember any of it, but I do blame its influence for the fact that I really, really like cheese. Mom worked for a while too, but my understanding is that Dad’s job was the driving factor. He’s the one still working at the same place. A couple of apartments, one of which I have the faintest memories of, then the house in the suburbs where my parents live to this day. Nothing too elaborate (if you remember the neighborhood from Desperate Housewives…yeah, all those houses are at least twice the size of ours), but nice and stable. Four years spent mostly in middle-of-nowhere rural MA. Interspersed with a semester abroad in the outskirts of Canterbury, New Zealand, which was great. For the most part I deeply enjoyed it! Met awesome people, followed cool opportunities, felt generally comfortable in the culture. But the rents kept rising, while my income kept…not. Then 2016 happened, when my vote (among three million others) didn’t matter because of where I lived. And, you know. That sucked. People killed by police in the US, 2018. Discontinued by the volunteer maintainer at the end of July, at 720. “Dallas police said Friday they are seeking a warrant for manslaughter against one of their own after an off-duty officer entered the wrong apartment in her building and killed a man who [actually lived there].” That’s right, she didn’t even pretend to be investigating a suspected crime, she just walked into a guy’s apartment and killed him. Justice for Botham Shem Jean. “They saw a car full of black people sitting in front of a Walmart, and they decided that was suspicious. They just began pouring bullets … It’s irresponsible. It’s dangerous. It’s mind-boggling, the use of force.” Justice for Diante Yarber. “[A police spokesperson] confirmed that Washington had a valid concealed carry permit. Washington was a Navy veteran and an employee with the United States Postal Service since 1998. He worked with the collections unit as a letter carrier at the main office in downtown Portland, where he also served as the union shop steward.” Justice for Jason Erik Washington. This last one, this is the big one. The way to stop this bad guy with a gun was to stop him from having guns, and the law had him clocked before the shooting, but with NRA-tied hands they weren’t able to follow through. Staying at my aunt’s apartment in Cleveland, which is in a building tall enough that I can see Lake Erie from the window. All the boxes I shipped ahead of time have arrived — they make a surprisingly small pile in the corner of one room. My parents showed up for the last few days in Boston, so everything I own that isn’t here is in the trunk of their car. Another couple trunkfuls of stuff went out on the front curb — books, dishes, still-half-full bottles of shampoo and body wash, lamps, fans, two entire cupboards’ worth of unbrewed tea. My two housemates each cleaned their own rooms, but, for various reasons, made no effort to help with the kitchen or bathroom. (Or return rental equipment, or put general-house-use items on Craigslist, or…I could go on.) So, while Mom focused on helping me pack the last round of boxes, Dad basically scrubbed the whole apartment. I don’t know what I would’ve done without them. And then…at last…to the airport! It had one stop after Boston before continuing on to Cleveland — same plane, just a new flight number — but I guess the computer hadn’t figured that out, because I had to haul my stuff off, get my boarding pass re-scanned, then turn around and haul it right back on. Didn’t get a lot of sleep the night before. Didn’t get any sleep on the plane, either. Every time I closed my eyes I saw half-packed boxes. But now I have slept! And eaten. And restocked on conditioner/deodorant/etc from the local CVS. And programmed my webcomics to allow admin access from this IP address. One more round of pre-move giveaways! 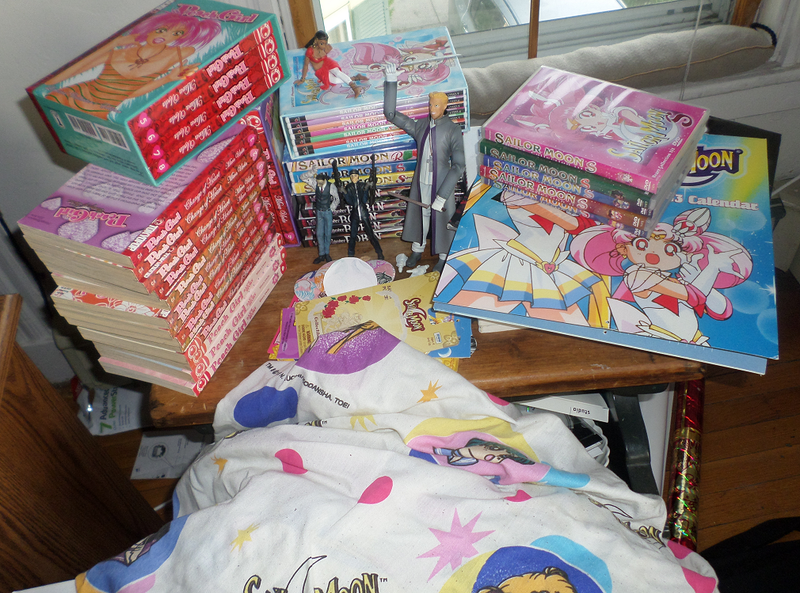 Plus some DVDs and manga volumes that aren’t free, but it’s easier to share them here than set up eBay listings. Unless otherwise stated, first person to claim a thing will get it. People who ask for a specific item will get priority over people who say “send me everything.” For the free stuff, all you have to do is pay the cost of shipping. If I tell you you’ve claimed a thing, but you don’t send me a shipping address within 2 days, I’ll move on to the next claimant. Any items not spoken for by May 28 are getting donated. Someone claimed these when I first listed them…but never sent me an address. So I’m offering them one more time. From the (translated) Japanese series, with lots of good tips and reference poses. Volumes: Arrival (1), Inquisition (3), Fugitive (4), Determination (5), and Vengeance (6). That’s everything except volume 2, which is filler-y enough that I owned the series for years without realizing I was missing anything. Take them all for $25, including shipping. Peach Girl volumes 1-8 (the non-flipped reprint, in two decorative cases), Peach Girl: Change of Heart volumes 1-10, and Peach Girl: Sae’s Story volumes 1-3. That’s the entire series, nothing missing. I’ll send you the lot for $60, including shipping. So, ah, these are worth…a lot. Everything else in the post is first-come first-serve, but on these I’m open to bids. If you’re interested, please comment on this post (don’t email or PM, I want to keep the details all in one place) with what you’re prepared to pay. The linked eBay listings aren’t mine, they’re just a reference for the specific edition I’m offering, and the price it’s going for elsewhere.